When the skin forms red, itchy bumps, it's usually sign that there's something wrong. The problem is, so many things might have caused the bumps that it can be difficult to know what went wrong. 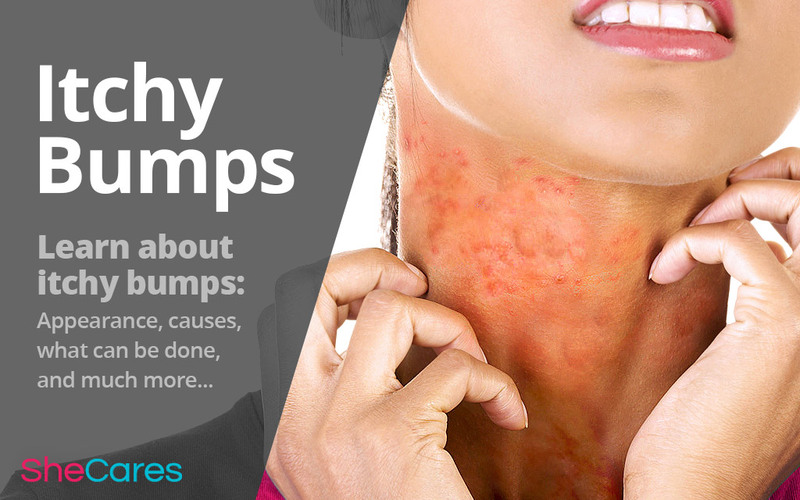 Learn more about the possible causes of itchy bumps and the treatment options. Itchy bumps are easy to recognize, since they are small, usually round, raised areas of skin. Often, bumps will be red, but it is possible to have itchy bumps that are your normal skin tone. Bumps usually appear grouped together, and it is very common to see a red rash with bumps as one of the symptoms. Insect bites. Bug bites - especially mosquito bites - are incredibly common, and they cause small, raised bumps to appear on the skin. These bumps tend to itch very strongly. Mosquito bites may not always be perfectly round, and are not always clustered in the same area. Ingrown hairs. Women who shave are probably familiar with the problem of ingrown hairs. After hair is shaved or waxed away, when it begins to regrow, it may have difficulty emerging from the skin. If it cannot breach the top layer of skin, it continues growing trapped underneath the skin, causing a bump. These bumps are usually red, and they are nearly always itchy or painful. Contact dermatitis. Sometimes, when the skin comes into contact with a certain material or object, it has a bad reaction to that object. In some people, it is an allergic reaction, but in others, it may just be a temporary rash. This is called contact dermatitis, and it often results in small, red bumps on the skin. Common objects that cause contact dermatitis are poison ivy and nickel jewelry. Eczema. Eczema, also called atopic dermatitis, is a long-term skin condition that is caused by a problem with certain genes that control the skin. It affects up to one in five infants, but many children will grow out of the symptoms. It causes a red, itchy rash that often produces itchy bumps as well. Infections. The skin can become infected by fungal, bacterial, and viral agents. A common sort of infection involves the hair follicles, and when an infection breaches the hair follicles, each follicle swells into a red, itchy bump. What Can Be Done about Itchy Bumps? The first step in managing itchy bumps is to determine the cause of the problem. Figuring out what caused the bumps can help to decide how to address them. Otherwise, the best method for managing itchy bumps is to moisturize the skin, apply ice packs or other cold objects, and use anti-itch creams to manage the symptoms. If there is any possibility that you have had an allergic reaction, you should seek a doctor's advice immediately. Additionally, rashes that last for more than two weeks or interrupt sleep need medical intervention. To learn more about managing skin problems, read about remedies for itchy skin.